Hillenbrand is a diversified industrial company serving industries around the globe. There are two disparate parts of the organization: the Process Equipment Group, which designs, creates and services industrial equipment worldwide and Batesville, a leader in the North American death care industry. They came to us seeking a new marketing website that could communicate all of the wonderful things they’re doing under the Hillenbrand umbrella. While Hillenbrand had an investor relation site, which communicated their stock’s viability to their investors, they didn’t have a marketing site. There was nowhere for them to share their accomplishments, or their activity within their community. They’re a global organization, but they’re proud of their hometown roots, and they’re happy to give back to the town they love. Additionally, Hillenbrand needed a space for job recruitment; their employees are the heart of the company, and there was no good place for them to share the many opportunities for employment on their investor relation website. With all of these requirements in mind, we set out to create a new website from scratch. The fact that we were building the site completely from scratch afforded us the freedom to create a site that would meet all of Hillenbrand’s needs. We knew we wanted the site to be mobile-friendly and responsive, so that it could be viewed on mobile devices as well as desktops, and we wanted to make it easy for users to navigate. 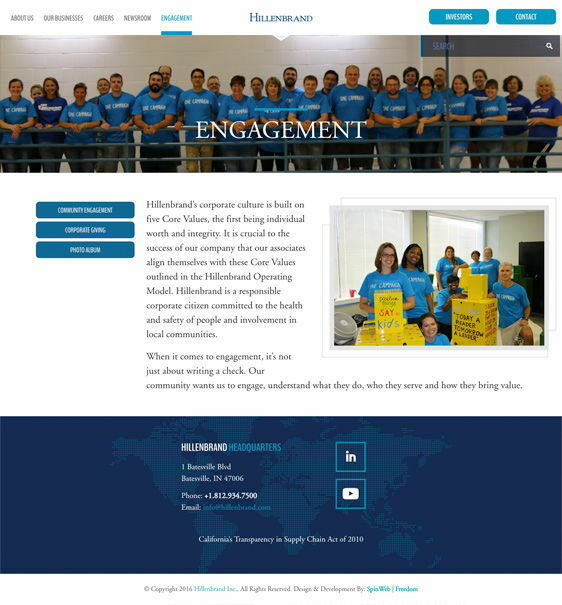 Additionally, we needed to make the website simple for the company to update— they won’t require a dedicated IT team if they want to update photos or add a news story. 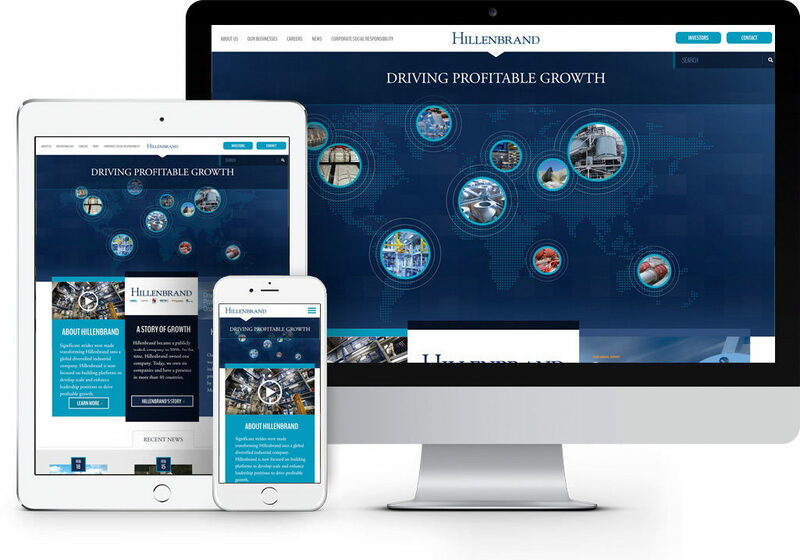 Hillenbrand’s site effectively conveys the global mindset of the organization as well as their deep connection to their community. The homepage is clean and easily navigated, and users can easily locate anything they need with the navigation menu at the top of the page. 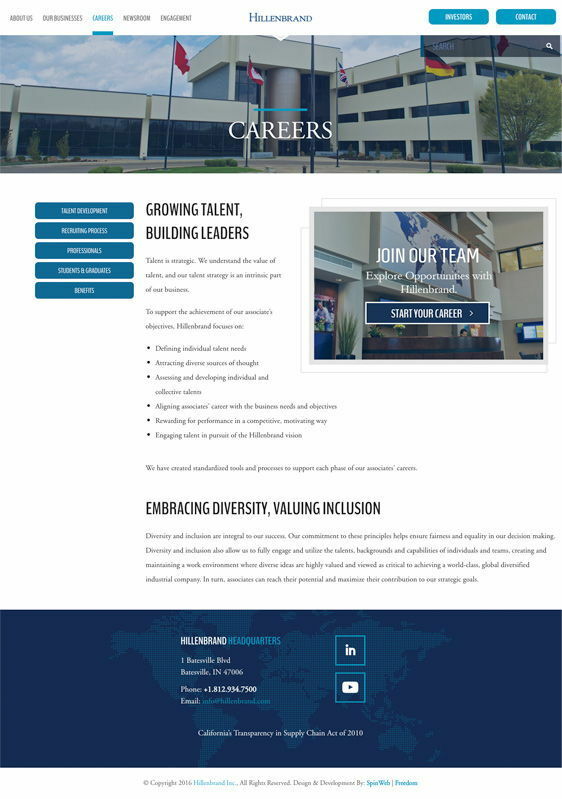 It’s vital that Hillenbrand attract top talent to work for them, so they wanted to expand their Careers page. Now, it details the recruiting process as well as the opportunities available, for professionals as well as students. Hillenbrand needed a space to share the organization’s news, so we created the Newsroom. 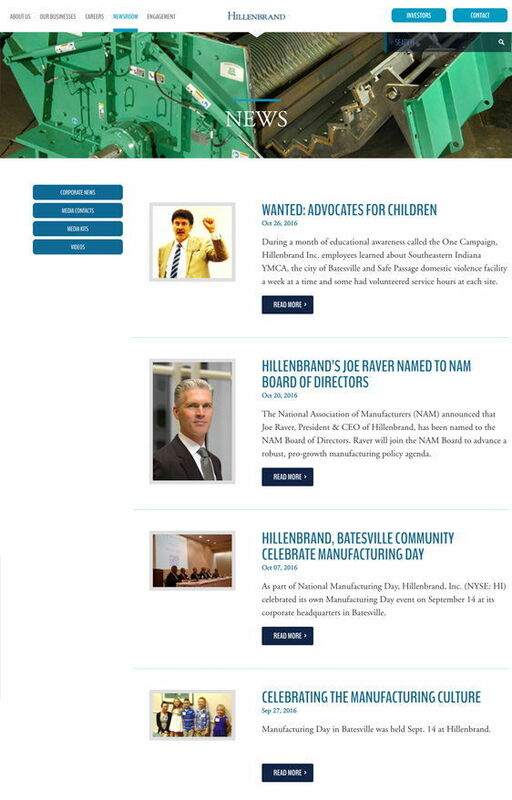 There, users can find not only stories about Hillenbrand and their partners, but also the media contacts and media kits available. Additionally, we provided a space for Hillenbrand’s YouTube channel. Hillenbrand’s community service is a big part of the organization, so we wanted to feature that prominently on their site. Here you can find examples of Hillenbrand employees adhering to their corporate culture by actively helping others in their local community.